Q: Please provide our readers with a brief introduction to Cosemi Technologies. A: At Cosemi, our main mission is to enable optical connectivity everywhere. By that we mean that we want to bring the unprecedented performance and distance that fiber optics provide to every wired interconnect – from data centers to enterprises, consumers and beyond. We are ushering in this next phase of optical interconnect proliferation with our best-in-class active optical cables (AOCs). Our knowledge of supply chain efficiency and deep technical capability in high-speed RF, optical packaging/coupling, and optical compound semiconductor design forms the foundation for all that we do. 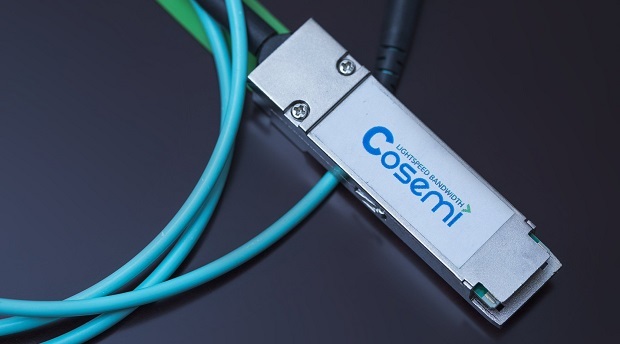 From industrial and commercial to B2B and consumer, Cosemi is taking optical connectivity beyond the traditional datacom and telecom markets. We are bringing semiconductor packaging methodology to optical interconnect solutions, which is fundamental to bringing our vision to life. Q: Can you expand on what “enabling optical connectivity everywhere” means? A: The proliferation of 4K today, the adoption of 8K/10K in the future, the desire for augmented and virtual reality in gaming and more are all fueling home, enterprise and cloud applications. Most interconnects in consumer electronics, video communications, and communications standards are written as an electrical interface. Over time, as new applications drive the need for greater speeds, higher bandwidth typically shrinks the distance communication can happen over passive copper links. Extending electrical interfaces via plug-and-play AOCs is what we do – and we are excellent at it. In the future, most wired interconnects will need (and demand) optical interconnects for their flexibility, light weight and ability to offer longer distance links at a very affordable price. Q: What are some of the benefits and differentiating features of Cosemi’s active optical cables? A: Our AOCs offer best-in-class performance while keeping the economics of consumer electronics in mind. Our patented assembly methods allow us to provide the performance and speed of fiber optics in cost-effective cable assemblies that plug and play as simply as any copper-based cable. Cosemi’s patented AOCs address the limitations of copper cables, while maintaining copper’s familiar plug-and-play nature and enabling thinner, more flexible cables. Our AOCs combine the best features of copper and fiber optics. We connect servers to switches, 4K/8K displays to the source, as well as help complete the connection in many other applications like machine vision, AR/VR, and the USB standard. Additionally, our AOCs reach up to 100 meters in length, making them the only interconnection choice for commercial and industrial markets where longer reaches are required. Q: What markets/applications are best suited for Cosemi’s cables and why? A: Data communications: 100G is the next upgrade cycle, and our AOCs are the perfect server-to–Top of Rack interconnect in data centers. Video Communications (VCOM): The proliferation of 4K (and soon 8K) video in broadcast, streaming, gaming, VR, machine vision, and professional audio/video requires AOCs as the next Direct Attach Cable for low to mid-market applications (1 meter to 100 meters). A: In addition to releasing the next generation of HDMI 2.1, we are focused on enabling select channel and OEM partners to scale the use of HDMI, Display Port and USB AOCs in leading-edge applications.